American Cruise Lines is the leader in small ship cruising! Carrying no more than 100 passengers, all of the small ships are able to easily navigate America's smooth, inland waterways and dock in the heart of each charming port. From Maine to Florida, the itineraries are designed to allow passengers to experience intimately each area's local culture, fascinating history and natural splendor. Unsurpassed personal attention and intimate ambience make American Cruise Lines the leader in small ship cruising. The all-American crew is friendly, polite and eager to pamper you. Highly skilled chefs treat passengers to delectable feasts, masterfully prepared with the utmost in care and quality, highlighting the flavors of the local regions. Refreshingly casual, flexible and unregimented - American Cruise Lines provides an intimate ambience conducive to camaraderie. Curl up with a book in the library, chat with new friends in one of the lounges, or watch the passing scenery from one of the open observation decks. Each night, passengers relive the day's adventures over complimentary cocktails and hors d'oeuvres before dinner. 10 Night Cruise sailing from Baltimore roundtrip aboard American Constitution. 7 Night Cruise sailing from Jacksonville to Charleston aboard Independence. 14 Night Cruise sailing from Jacksonville to Baltimore aboard Independence. 7 Night Cruise sailing from Seattle roundtrip aboard American Spirit. 7 Night Cruise sailing from Charleston to Jacksonville aboard American Star. 7 Night Cruise sailing from Memphis to New Orleans aboard America. 7 Night Cruise sailing from New Orleans roundtrip aboard Queen of the Mississippi. 7 Night Cruise sailing from Clarkston to Portland aboard American Song. 7 Night Cruise sailing from Clarkston to Portland aboard Queen of the West. 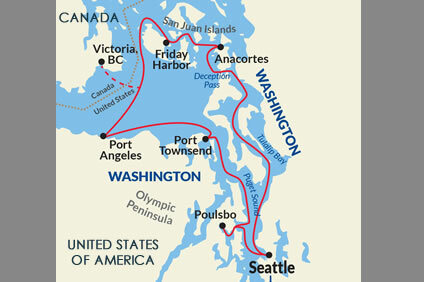 7 Night Cruise sailing from Seattle roundtrip aboard American Constellation. 7 Night Cruise sailing from Charleston to Baltimore aboard Independence. 14 Night Cruise sailing from Jacksonville to Baltimore aboard American Star. 7 Night Cruise sailing from Jacksonville to Charleston aboard American Star. 7 Night Cruise sailing from New Orleans roundtrip aboard America. 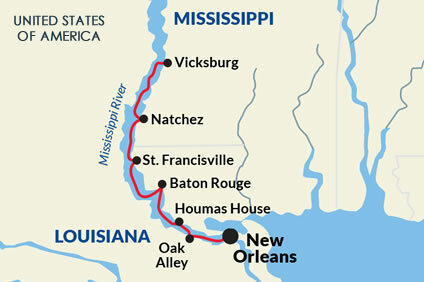 7 Night Cruise sailing from New Orleans to Memphis aboard Queen of the Mississippi. 7 Night Cruise sailing from Portland to Clarkston aboard American Song. 7 Night Cruise sailing from Portland to Clarkston aboard Queen of the West. 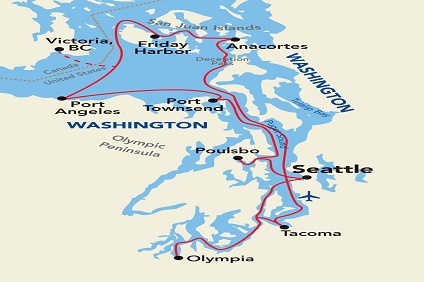 10 Night Cruise sailing from Seattle roundtrip aboard American Constellation. 6 Night Cruise sailing from Baltimore roundtrip aboard Independence. 7 Night Cruise sailing from Charleston to Baltimore aboard American Star. The dining experience with American Cruise Lines is a very special one. Each ship has a spacious dining salon that seats all passengers at one time. Our highly skilled chefs trained at the some of the most prestigious Culinary Institutes prepare each meal to order with the utmost care and quality. There are a variety of choices at every meal that frequently include a specialty dish highlighting flavors from the local region. The young, all-American dining room staff is always friendly and accommodating, and eager to pamper you, making sure that your dining experience is just the way you like it. The atmosphere for dining is informal - no gowns or tuxedos, please - but do sit with whomever you like. Each table has an outside view, so take your time - meals are cooked to order and this is a great time to build new friendships. Tipping is, of course, at the individual's preference, but American Cruise Lines asks that you do not tip until the last day of the trip. A customary amount is US$125.00 per person, but feel free to tip as you see appropriate. Cash, personal or travelers' checks are the preferred method. Credit cards are also accepted, with requests that passengers paying with credit cards contact the Hotel Manager at least one day before the end of the cruise. American Cruise Lines ships and itineraries are designed for travelers who share an interest in history, culture and nature. Guests truly enjoy the onboard ambiance, and feel very at home in our huge lounges, single-seating dining salon, and oversized staterooms. Thus while children are welcome there are no specific facilities or baby sitting services provided.